7.1 What are prepaid debit cards used for? 7.2 What is the difference between a debit card and a prepaid debit card? 7.3 Can you withdraw money from a prepaid card? 7.4 Can you use a prepaid debit card at an ATM? 7.5 Can I transfer money from a prepaid card to my bank account? 7.6 Do all prepaid debit cards require a social security number? A prepaid debit card can be used just as you would any other debit card, except that it is preloaded with cash instead of being connected to your checking account. It comes with a number of benefits that both individuals with bank accounts and those without may wish to take advantage of. A prepaid debit card helps you stay on a budget because you can’t use it to make a larger purchase than your current balance. If you don’t have a bank account for whatever reason, you don’t have to worry about carrying cash around and can also shop or pay bills with it online. However, some cards come with different restrictions and fees, so it’s smart to explore all of your options before selecting which one you’d like to get. Here are our favorite prepaid debit cards for 2019 — which one is yours? The ClearSpend Visa card from BBVA Compass serves as a prepaid debit card that allows you to make purchases just about anywhere. You can even track your spending through the ClearSpend mobile app and get real-time budget alerts. If you want to get a joint account with your spouse or partner, you can even share budgets in the app to track who spends what. You don’t have to pay any overdraft fees, purchase transaction fees, or load fees. If you load at least $400 each month, your monthly service charge will be waived. Otherwise, you’ll pay just $4 a month to use the card. The application process is also extremely simple and it doesn’t even include a credit check. So how exactly does the ClearSpend prepaid Visa card work? First, download the app for either your iPhone or Android smartphone. You can order your card directly from the app or online. Then, choose how you want to load your funds. You can do it in person at a BBVA Compass branch or Visa ReadyLink location, or via transfer using a service like PayPal, Venmo, or Popmoney. You can then start using your prepaid debit card anywhere you’d like. After a month, the app analyzes your expenses to recommend a budget for your expenses. It’s a simple, fun way to track your money. 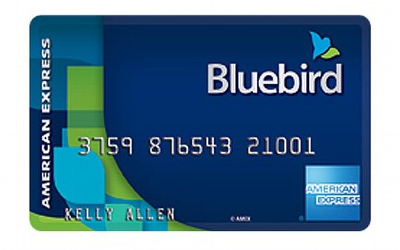 The Bluebird prepaid card is actually from American Express, so you can shop anywhere AE is accepted. Plus, you have access to over 24,000 free ATMs throughout the country. 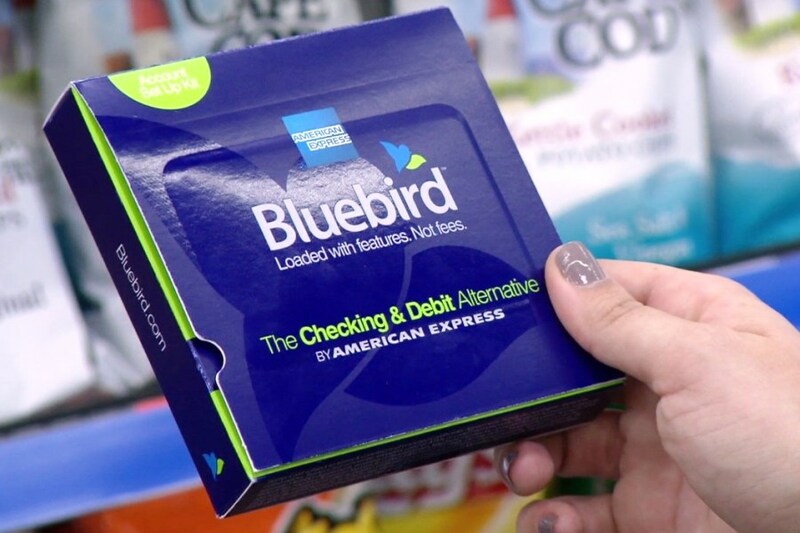 Even better is that there are very few fees associated with the Bluebird prepaid card. For example, there is no activation fee or monthly fees. There also aren’t any foreign exchange fees, making this a better alternative to carrying cash when traveling abroad. When you’re ready to reload, you have a number of options. You can enroll in a direct deposit as you would with a traditional checking account so that your regular paychecks go straight onto your prepaid debit card. Or you have the option to deposit cash at just about any Walmart checkout register. Debit card transfers and mobile check captures are also available when it comes time to reload your prepaid card. Bluebird also offers a variety of user-friendly features. It’s great for families because you can have up to four different cards each with its own spending limit (making it great for allowances). There’s also a personal finance management tool called Insights, which gives you just that — insights and advice on how you spend your money and how to stay on track with your budget. This prepaid card is accepted anywhere you can use a MasterCard, both online and in person. You aren’t required to have a PayPal account in order to qualify for a card, but it does allow you to access helpful online functions you otherwise wouldn’t have. While there’s no credit check performed when you sign up, you will be charged a $4.95 monthly fee just to use your prepaid card. Depending on how you choose to reload your fee, you might incur additional fees ranging anywhere between $0 and $3.95. Paypal also doesn’t have any free ATMs you can use, so you’ll have to pay the fee of whatever ATM you’re at if you want to withdraw cash from your account. 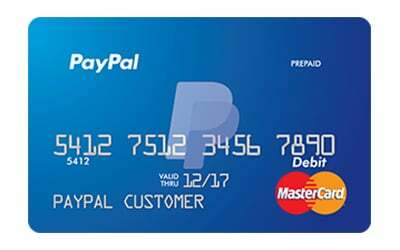 On the bright side, the PayPal Prepaid MasterCard offers cash back rewards and other special offers. You can also sign up for a high yield savings account where you can get up to 5.00% APY on your balance up to $1,000. Another bonus is PayPal’s refer a friend program. Get a friend to sign up for a card and deposit at least $10 and you’ll both receive an extra $5 in your account. 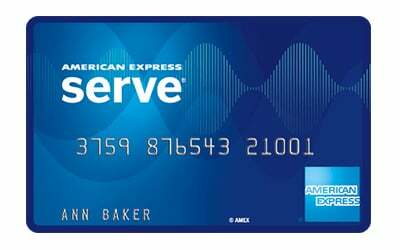 American Express actually offers three different types of Serve prepaid debit cards. The regular Serve card is a basic account that provides free early direct deposit, free ATM withdrawals from any MoneyPass ATM in the country, and free online bill pay. Additionally, you can sign up for multiple subaccounts. The price of the card is free if purchased online, otherwise, it costs up to $3.95 if bought at a retail location. There is a $1 monthly fee but you can get that waived if you sign up for direct deposits totaling at least $500 each month. Cash reloads can also cost up to $3.95, depending on where you go to reload your card. If you use a non-MoneyPass ATM, you’ll be charged $2.50 in addition to any charges from the ATM company. Another option is the Serve Free Reloads Card. Along with the basic Serve card, this one offers free reloads at tons of national retailers, such as CVS, Walmart, Dollar General, and 7-11. The monthly service fee is $4.95, but that may not be a lot to you if you frequently pay reloading fees. Your final option is the American Express Serve Cash Back Card. The monthly fee is $5.95, but you earn an unlimited 1% cashback on all purchases made on your card. If you spend a lot of money with your prepaid debit card, you could quickly earn a nice bonus. 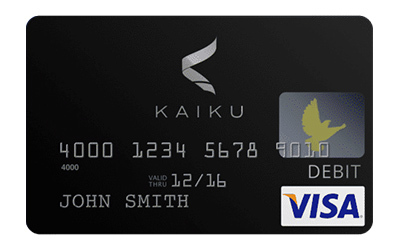 Kaiku is a low-cost prepaid card that allows free transactions at any Allpoint ATM — that’s over 55,000 ATMs throughout the U.S.
There’s a $3 monthly fee unless you elect to sign up for direct deposits totaling at least $750 each month (after that there’s no fee). You can also use the Kaiku mobile app on your smartphone to deposit checks electronically by snapping a picture. Other free deposit options include transferring funds from your bank or PayPal account. If you want to deposit cash, you can do so through Visa ReadyLink or MoneyGram, but you’ll have to pay between $2.95 and $4.95 for each transaction. To help track your finances, Kaiku automatically includes the Funds-Ometer which tracks and compares your spending habits each week and then compares it to your 60-day averages. The information is broken down into helpful categories such as dining out and entertainment. *Also worth noting is the card’s hipster-chic vertical woodgrain design that can be customized to one of six colors to suit your style. 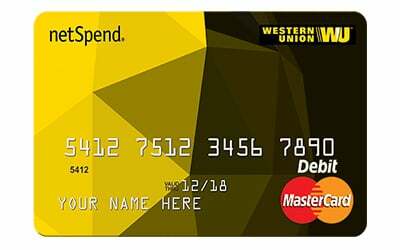 The Western Union NetSpend card has several different tiers of fees, so you can choose the one that best suits your spending style. The first option is to pay-as-you-go. There’s no monthly fee, but you instead have to pay $1.00 for each signature purchase (when you run your card as a credit card) and $2 for each PIN purchase (when you run your card as a debit card). This can be an expensive option if you make a lot of purchases on a regular basis. Your next choice is the Monthly FeeAdvantage Plan. Instead of paying for each individual transaction, you instead have a flat fee of $9.95 each month. The final option is the Premier FeeAdvantage Plan, where you pay just $5 a month. In order to qualify, you must have at least $500 in monthly direct deposits. It’s also worth noting a few additional fees you might incur with all of these plans. There is an account inactivity fee of $5.95 a month, plus a $0.50 balance inquiry fee over the phone or at an ATM (*text inquiries are free). Finally, you’ll incur a $2.50 fee any time you withdraw funds from an ATM, plus whatever fees the ATM owner charges. Before you make a decision on which Western Union prepaid debit card is right for you, think about how and where you spend money, and what kind of direct deposits you might be able to use. It’s better to think about these things in advance because small fees can quickly add up. What are prepaid debit cards used for? A prepaid debit card can be used for making payments just as you would with a traditional debit card linked to a checking account. Generally speaking, a prepaid debit card contains a major brand like Visa or MasterCard, so you can use the card anywhere those kinds of transactions are accepted. This includes physical retailers as well as online stores. If you don’t qualify for a bank account and have issues shopping online because you don’t have a debit or credit card, then a prepaid debit card is an extremely accessible option. There are a few key differences between a debit card and a prepaid debit card. The biggest one is whether or not you need a bank account. A typical debit card requires you to have a checking account with a financial institution like a bank or credit union. Many people, however, can’t qualify for a checking account. If that’s the case, you can purchase a prepaid debit card that’s used in almost the same manner. Instead of depositing funds into your bank account, you load funds directly onto the prepaid card. The exact process depends on the card you choose. Oftentimes, you can set up direct deposit, add funds online or through your phone, or add cash in person at a participating retailer. Another difference between a debit card and a prepaid debit card is that while checking accounts are FDIC-insured, most prepaid cards are not. If the company goes out of business while you have funds on your card, you may not see that money. Can you withdraw money from a prepaid card? There are some ways you can withdraw money from your prepaid card, one of which is through PayPal. You can’t add the funds directly to your wallet in order to then transfer to a checking account. You can, however, add the funds from your prepaid card to your PayPal account to use for online shopping. It’s not the same as having cash in your pocket, but it does give you an alternative option for your spending. You can also add a prepaid debit card to places like your Amazon wallet to use towards purchases. Can you use a prepaid debit card at an ATM? The other way to get money from your prepaid debit card is by using an ATM. The key to success is checking on your debit card for participating ATMs. If your card is branded with a major creditor like Visa or MasterCard, you should be able to make a withdrawal at any ATM accepting those cards. There are two things to remember when making an ATM withdrawal with your prepaid credit card. First, check on the fees from both your debit card carrier and the ATM you’re visiting. Also check your card agreement to find out if there’s a daily limit on how much cash you can withdraw each day. Can I transfer money from a prepaid card to my bank account? In most cases, you can’t transfer money from your prepaid card to your bank account. You would need to first cash out the funds and then make a separate deposit into your account. However, all card companies are different, so you can double check this detail in the user agreements of available options to see if one may offer this service. Do all prepaid debit cards require a social security number? No, and that’s one of the reasons many people prefer a prepaid debit card. As long as you have the cash to load funds on your card, you can qualify. No social security number is required, so you don’t have to worry about any impact on your credit score, your past history with banks, or your residency status. Prepaid debit cards offer a lot of benefits to all types of people looking for a better way to pay than just cash.